At O’Grady’s Landscape, we often include water features in our landscape designs. We find that our clients appreciate both the aesthetic appeal and the soothing sounds of water in their properties. Adding a fountain to a patio is a unique way to get creative with the design, while a waterfall integrated into a wall design provides visual interest that can be enjoyed at any time. If you are interested in including a water feature in your landscape, patio, garden, or wall design, we can help. We serve homeowners in the City of Falls Church, North Arlington, Great Falls, Vienna, and McLean. Contact us today to get started! Fountains – fountains or water urns can easily be implemented in any part of your landscape design. They offer unique visual interest that’s appealing everywhere from the home entry way to your patio and garden designs. Waterfalls – waterfalls can be integrated into a wall design, bringing the calming sounds of water to your backyard space with unparalleled style. This is another great complement to your patio design or even your entire backyard space. A great example of a wall waterfall can be found in our North Arlington backyard landscape project, pictured below. 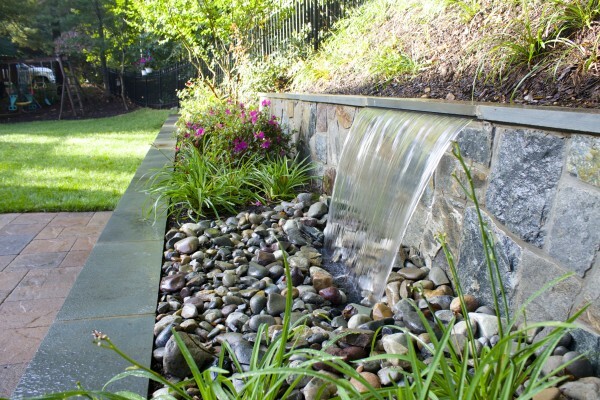 Backyard Streams – a meandering stream can allow you to connect with nature, bring a peaceful quality to your backyard space, and add one-of-a-kind beauty to be enjoyed from interior windows and outdoor living spaces alike. A koi pond is just one option to consider, and we can design a custom walkway around it to help you better enjoy the views and improve functionality. 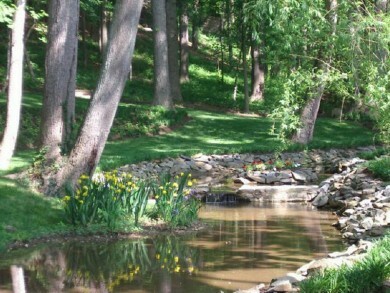 If you live in the City of Falls Church, North Arlington, Vienna, Great Falls, or McLean, O’Grady’s Landscape can help you plan out your landscape design with beautiful water features for the most breathtaking views. Our water features are particularly appealing for those looking to get creative with tiered patio designs and are also integral parts of many garden designs. No matter your needs, there are many options for a design that suits you and your property. Ready to get started? Request a consultation, get your free quote, and see how we can incorporate water features into your backyard space!